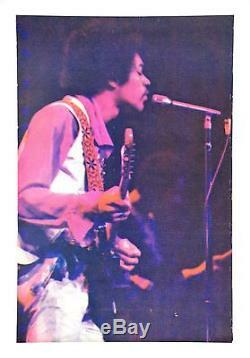 Authentic Original Gemini 1970 Seriagraph Black Light Day Glow Luminescent Item of "Jimi Hendrix". Photograph was taken by Ralph Garcia. It Measures 23" X 36". This Item is in Very Good to Excellent Condition (C7-C8) which is rare since the phosphorescent colors used in black-light posters and often show many cracks due to the tight rolling into small plastic tubes when they were offered for sale in head shops in th 70's. The serigraph color were applied very thickly to insure Brilliant Black Light Luminancence when viewed and the consequence was some brittleness of the day glow reflective tempra colors. We also have our items flat and in correct humidity 50-60% so all out items are in the best condition you will find for vintage works as these. We grade our items according to the Iguide Universal 10-Point Grading Scale. C10 Mint - Investment quality. No perceptible flaws of any kind. C9 Near Mint - Investment quality. Minor flaw on an otherwise unused Item. C8 Excellent - Investment quality. Pin holes, small tears, etc. C7 Very Good to Excellent - Fine. Still a very nicely preserved item. C6 Very Good - The typical used item in average condition. C3 Fair - Heavily worn, but yet still complete. C2 Poor to Fair - An extremely worn, possibly even incomplete item. C1 Poor - The lowest grade, representing items in the lowest possible condition. Kept Flat, in a Smoke, Dust, and UV Light Free storage facility for over 40 years that has allowed the Image to retain its brilliancy without any fading. Item is Not Reprint, Giclee Print Nor Ink Jet Print, Item is Original Serigraph Black Light Day-Glow Ink Item from 1970. The Item has much visual appeal in normal light and under a black light there is an extra glow of intense brilliant color. Kept Flat, in a Smoke, Dust, and UV Light Free storage facility that has allowed the Colors to retain their Brilliancy without. Double tubing would cost extra, but we provide it free for our customers. Customer comments have shown they truly appreciate this free extra care. When You receive your item, There will be an inner tube inside the outer tube. Please unwrap the outer wrapping on the inner tube. The Item is rolled onto the inner tube NOT inside the inner tube. The item "Jimi Hendrix Original 1970 Seriagraph Black Light DayGlow Poster by Ralph Garcia" is in sale since Tuesday, February 12, 2013. This item is in the category "Entertainment Memorabilia\Autographs-Original\Music\Rock & Pop\Posters". The seller is "rarepics914" and is located in Pelham, New York. This item can be shipped worldwide. Size: It Measures 23" X 36"